Are you super busy at the moment? Maybe you’re in your own purposeful bubble doing what you need to, waiting to see if there’s more time and you have more energy than you first thought; that’s a good place to be because your priorities are the right ones and you so need to put yourself first, a bit like the instructions at the start of a flight when we’re told we should in an emergency, put on our own oxygen masks before helping anyone else. These are four things I try to make time for in December through to January. relaxation: making sure I get good sleep, following routines and preparing my sleep environment, I’m thinking fresh linen, a warm quilt and a spritz of flower essence to soothe me to sleep. I also like to read more in mid winter and have a pile of books to enchant me some new and some I like to revisit. I tend not to go for too many classic novels though because I’m looking forward and tuning into the challenges of a new year. hydration: I’m not a great drinker of water throughout the day but I love warm punch, cordials and infusions. My favourite at the moment is a ginger and lemon tea with cinnamon and honey. I grate ginger, no need to peel it and some lemon zest whilst the microplane is out and then add hot water to some green tea and maté leaves and a cinnamon quill. Drizzling a bit of honey into the first cup adds a little extra calm and comfort. creativity: Every day starts with a bit of a plan for making things; a photo shoot, writing my journal, a forage walk, a recipe to research, a space to make ready. After dinner there’s another window for research and writing and maybe an Instagram post. spending time outdoors: Probably the most important of all because that’s when I feel the most inspired; walking the footpaths here in the Cotswolds, savouring light and temperature, looking at colours, shapes and textures and listening to natural sounds give me a new experience each time I’m out. I try to banish thinking about other things so I can make merry with the world around me, not a wilderness, nor a wonderland but an everyday loveliness I treasure. 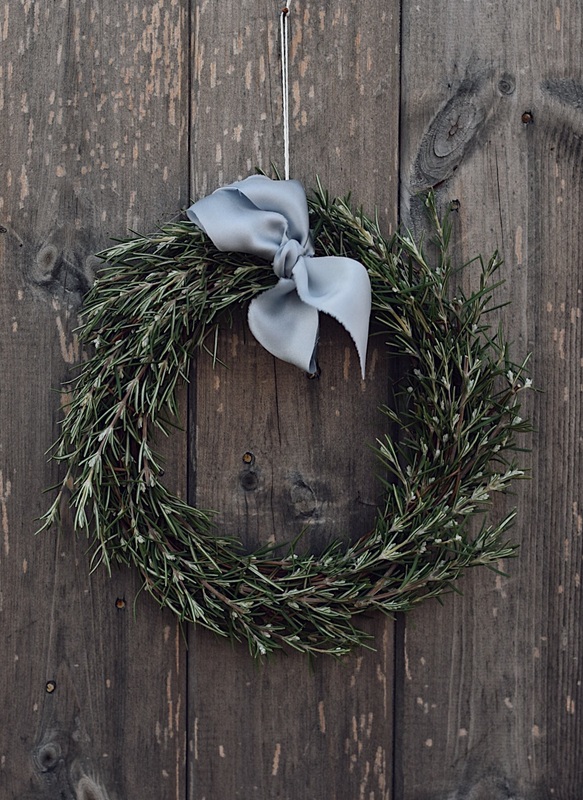 photos: The wreath is made from stems of foraged rosemary from the footpath at the back of my garden: I made the ribbon from a piece of silk I had. I really want to start dyeing silk for ribbon making. 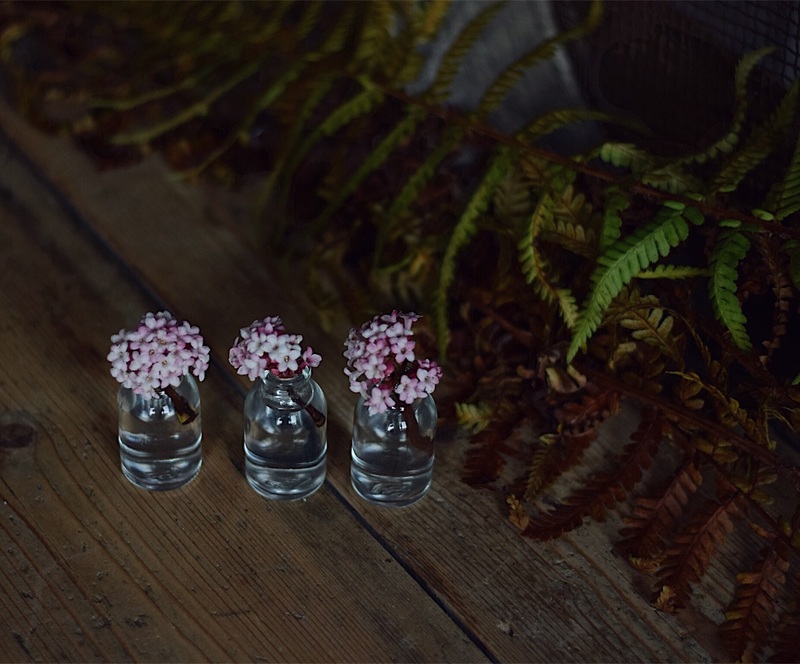 The viburnum blossom is out now and I’m thinking about this woodland fern or bracken for the Christmas table.